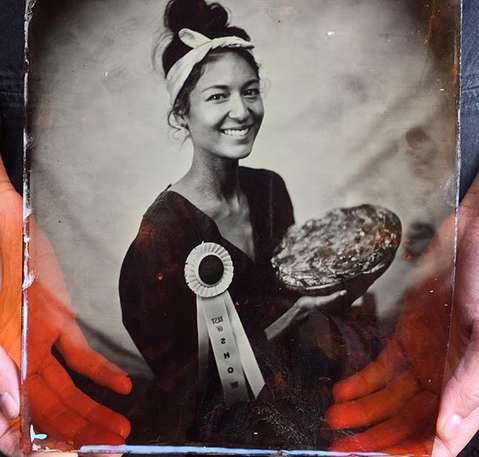 <b>PIE MAKER IMMORTALIZED:</b> Upon winning last year’s Best in Show crown, Melissa Bishop had a tintype photograph taken by Lindsey Ross of La Chambre Photographique (<a href="http://www.lachambrephotographique.com">lachambrephotographique.com</a>). 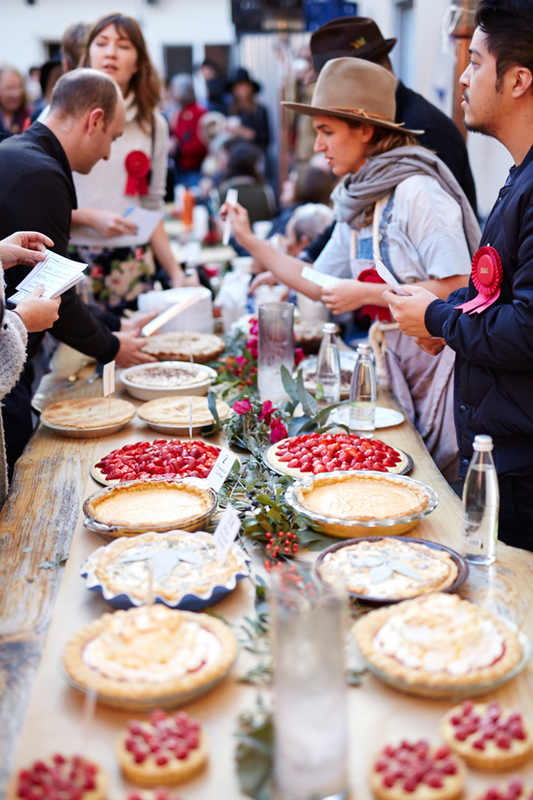 Last year, when photographer/author Leela Cyd and illustrator/stylist Joya Rose hosted the first ever Spectacular Santa Barbara Pie Contest at Sama Sama Kitchen, an Ojai caterer and private chef named Melissa Bishop wowed the crowd with a spiced-lamb tagine pie topped with turmeric cream, which won her the Best in Show award. To help us prepare for this year’s second annual contest, which is on Saturday, December 3, 3-6 p.m., at Potek Winery in The Mill (406 E. Haley St., Ste. 1), Bishop told us some of her secrets. Tell us about yourself. My home is Ojai, and I cook for a living, mainly doing retreat catering in town and providing regular meal service for private clients. What’s your pie-making background? My father’s favorite food is olallieberry pie from Duarte’s in Pescadero, and I grew up eating it regularly. That said, I have always thought of myself as an intuition-led cook as opposed to a scientifically inclined baker. I am much more of a pie eater than a pie baker. In fact, the first cooking blunder that I can ever remember was when I tried to bake biscuits as a teenager and added four times the amount of baking powder, resulting in inedible bricks that tasted like a metal bowl. Tell us about last year’s winning pie. When the pie competition was announced last year, I was enrolled in Food Forward’s Master Food Preserver course. My classmate Jess Wang, a chef in L.A., made the best pie that I had ever tasted: curried beef with perfectly executed crust. I couldn’t stop thinking about that savory perfection for weeks, so I challenged myself to rise to the occasion and bake a pie. From that curried-pie origin, I followed my kitchen lineage back to my dear friend and co-caterer Ayda Robana, who makes the best tagine I have ever eaten. Slow-cooked lamb with dried apricots and prunes was the obvious choice, as well as some preserved lemon flecked throughout the mixture, and the savory turmeric whipped cream on top was my personal touch. To be honest, I loved my pie, and every parent wants their pie-child to succeed, don’t they? Will you be back to defend your crown? Yes, I will be entering this year. After hemming and hawing, I just signed up this week! No solid plans yet, but you can count on a flaky crust. What tips do you have for other pie-makers? Butter. Use butter. Don’t mess around with shortening or vinegar or vodka. Just use butter. The Spectacular S.B. Pie Contest contestants can register online for $25 to compete in one of seven categories: Sweet, Savory, Best in Show, Junior, People’s Choice, Wild Card, and Special Diet. Prizes include McConnell’s ice cream cakes; a robe, pajamas, and boots from UGG; gift cards; and more. Those who’d like to eat but not make pie can also attend, though a $15 donation is suggested. Proceeds go to the Transition House. See tinyurl.com/sbpie2.